One of the many things lost in the haze of the magnificent Stenson-Mickelson battle for the ages at Troon was Henrik's bizarre career arc. It's easy to forget that he hit rock bottom many years ago, but with the help of instructor Pete Cowen, Stenson built a swing that led to one of the great performances in major history. Bob Harig files this super profile of the Cowen/Stenson partnership for ESPN.com. Stenson turned pro in 1998 and found some early success on the European Tour. But at the European Open -- at the K Club in Ireland -- his game, his ego and his confidence took a hit 15 years ago, one from which it is amazing he recovered. Playing in July 2001 with Miguel Angel Jimenez and Sandy Lyle, Stenson came to the 13th hole and hit a massive slice that would not have been so alarming if he had not hit a massive hook on the same hole a day prior. Stenson had no idea where the ball was going, and was so spooked by his lack of form that he withdrew. Two months prior, Stenson had won the Benson & Hedges International tournament, but now he wondered if he'd ever be able to compete again. Great chat with Dan Patrick by The Open champion, Henrik Stenson who confirms he was, indeed, in the zone. The Open In The UK: 3 Million Fewer Viewers, Pricing Out Some? While the move to NBC actually expanded the number of homes for The Open, the shift from BBC to Sky Sports in the UK was expected to mean a drop in audience size. John Westerby in The Times wrote about a variety of topics, including the Sky ratings. The drop is pretty staggering. Peak viewing figures on Sunday were around 1.2 million, compared with the 4.7 who watched Johnson's victory on the BBC on the extra day at St. Andrews last year. The highlights package on BBC2 on Sunday attracted about 1.5 million viewers. On Monday in Glasgow, I had a random chat with a 22-year-old fan who was raving about the final round drama. I asked why he didn't go and it was cost related. He was genuinely dejected by the lost opportunity. When returning my car, the representative also raved about the final round and said his father attended, sitting on 18 all day. I asked why he didn't go. Again, cost was cited. 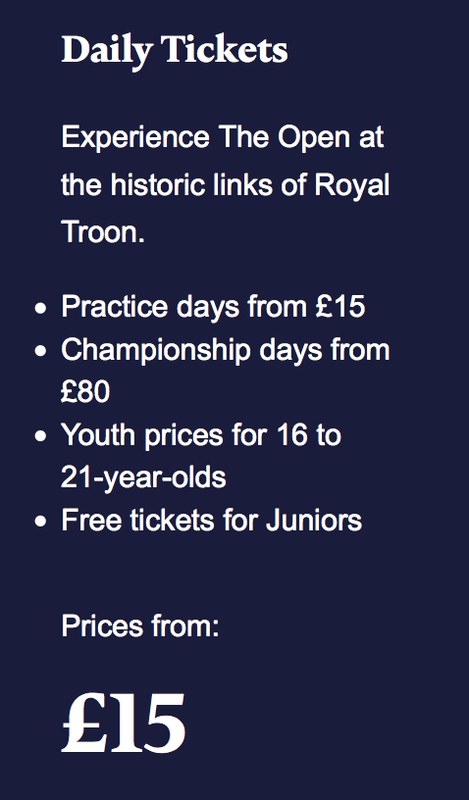 This year's Open did include free entry for those under 16 and special pricing for those 16-21. There was also the camping village to appeal to the festival-goer mindset. But the £80 entry fee, coupled with £15 for parking, is cost prohibitive for many and probably explains the small crowds Thursday through Saturday. Given the R&A's desire to be accessible to more young people, the combination of millions not seeing the golf and plenty more feeling like they're unable to afford the event, can't be positives for The Open. 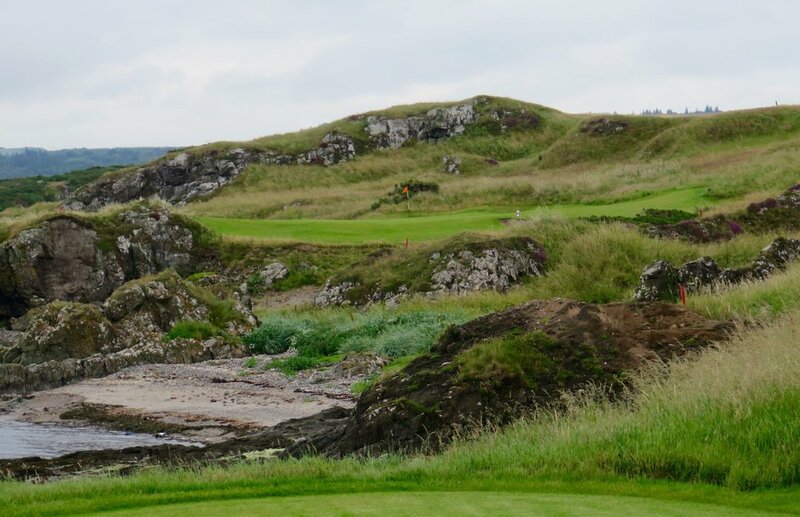 Prestwick: "The whole place has the patina of legend about it." Before the focus turns away from the west coast of Scotland and the epic 145th Open, I hope we can also remember the importance of Prestwick Golf Club and all that it means to the game. 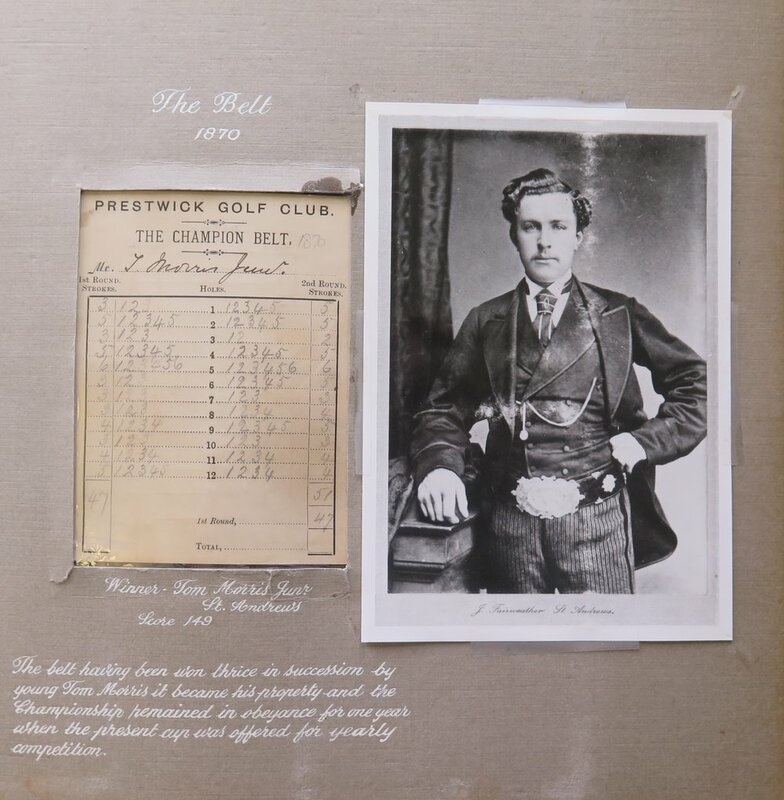 Daydreaming a bit while walking around the clubhouse with club historian Andrew Lockhead, one an easily imagine what that first gathering of professionals was like, capped off by Tom Morris hitting the opening shot. But what strikes most is how, based on the documentation and formality of the proceedings, how those involved knew they were on to something historic. 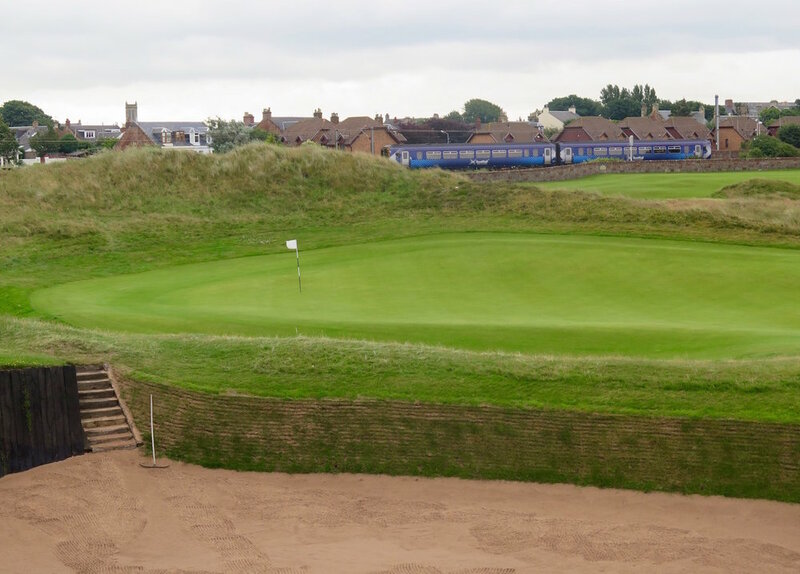 The Guardian's Paul Weaver took the full tour as well, and captures the essence of this great clubs, which maintains an amazing reverece for its history without the attitude that could come with having such a vital place in golf. The Archive Room, with pencilled-in scores from the 1860s, tells tales of terrible traumas outside. Darwin added: “Holes and bunkers that can bring down great men with so terrible a crash deserve great names and in these Prestwick is rich; the Slough of Despond, Purgatory, the Goose Dubs, Lion’s Den, the Pill Box, the Precentor’s Desk and Sandy Neuk.” It feels friendlier in the clubhouse. 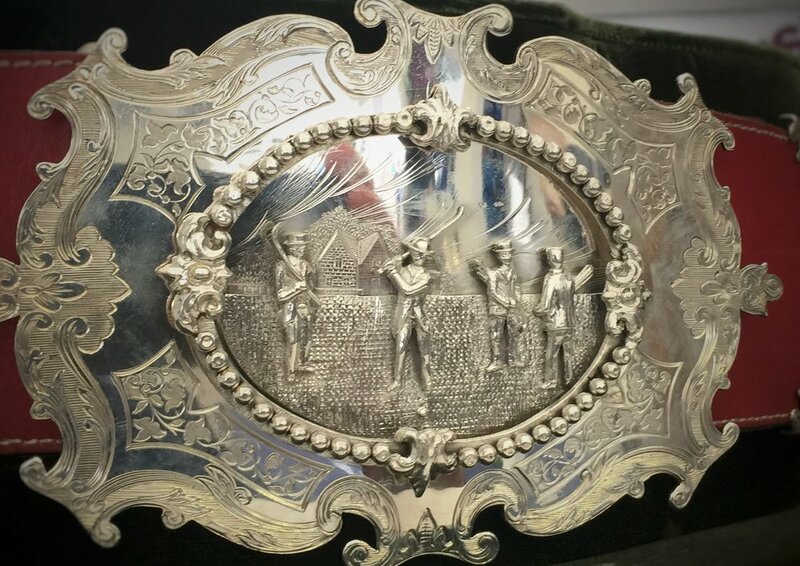 Detailed look at the face of the belt, from an exact replica on display at The Open this week. While the initial contest was for the Champion Belt and was essentially an invitational open to those with ties to ten or so clubs, it was the realization that the "world" needed to be part of "Open" competition that proves so mesmerizing to see put on paper. It makes the branding emphasis on open take on greater meaning. 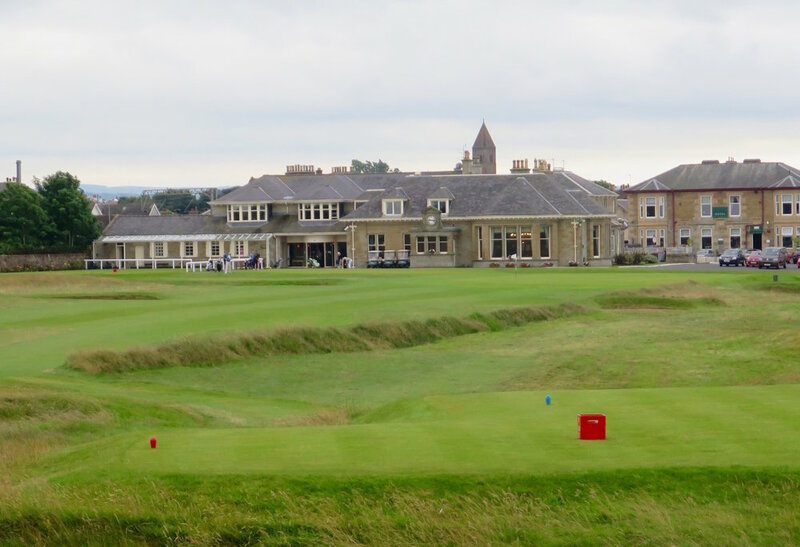 As for Prestwick's architecture, the course retains its playing charm and design fascination, an astounding notion given how so many courses do not age well. The appreciation heard last week for its merits is heartening and offers more evidence that a greater awareness for design is in the game. Just like North Berwick's recent renaissance, Prestwick no longer is getting tagged with a negative "quirky" or "bizarre" labels. Instead, the overall walkability, memorability, variety and at times, audacity of the holes appeals to a broader golf audience than 20 years ago. The fun word is getting throw about too, and never in that demeaning way suggesting the course is too "easy." And the 17th/Alps remains as bizarrely nutty as ever. How did they play this with a baffing spoon!? Prestwick's place in the game is as vital as the Old Course is today. 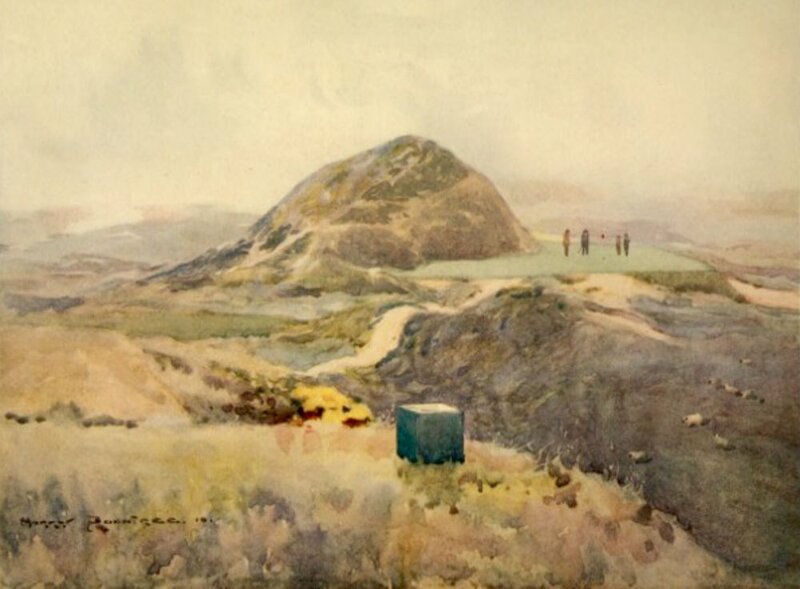 It was the birthplace of professional golf and a testing ground for golf architecture both manmade and natural. 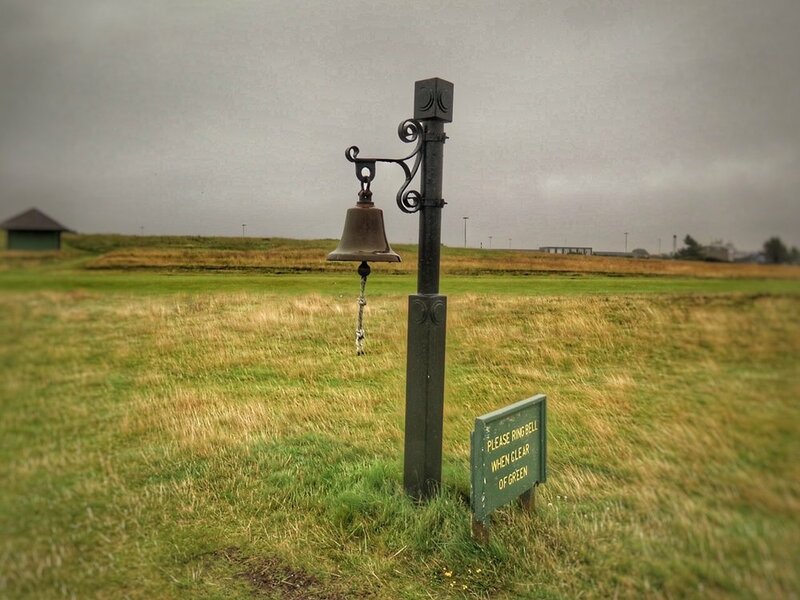 Because of its place through golf history as a joyous locale for the game--continued on by today's club--Prestwick should always be one of your first stops for a Scotland golf pilgrimage. 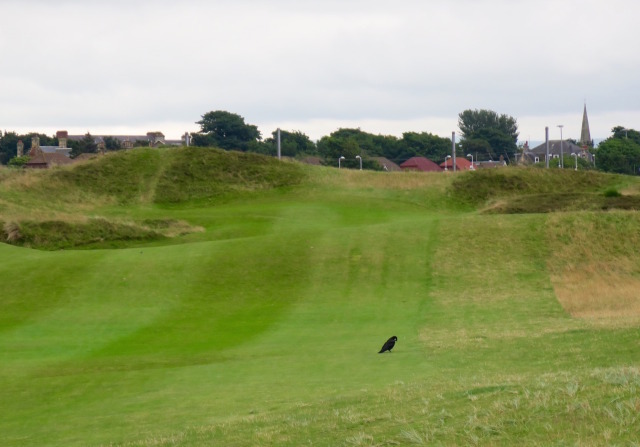 Furthermore, many clubs with a trace of the history Prestwick enjoys could learn from the way this grand place in the game proudly shares itself with the world for all to come and see and play. Every professional golfer should pay a visit out of respect for those who gave birth to their pastime. These are issues I delved into in this week's Golf World after Troon successful hosts another Open. With Muirfield's current suspended status leaving the R&A with nine choices, I point out that avoiding Turnberry because of Donald Trump (and after recent improvements) would be a mistake for the rota. Troon? Very fine venue and every dozen years, is just right for The Open. Shoot, 12 years from now the R&A media hotel suggestion, the Adams Family House, may even have internet and fire extinguishers attached to the walls! More disconcerting is a likely return to Royal St. George's in 2020 without some restoration and softening of bad modern era tweaks (when the superior Deal/Royal Cinque Ports is available). Throw in possible pouting over The Donald's comments, eliminating Turnberry from the rota, and the R&A will suddenly have a much weaker rota if they avoid Turnberry (and have Muirfield on the outside looking in). A more extensive Turnberry review is in the works. Sports Media Watch breaks down some of the numbers and the real eye opener may be Saturday's third round out-rating the U.S. Open's, which was in the evening presumably when there would be more eyeballs. But who knows! Maybe golfers like their televised play early and June summer evening golf. The 2.75 is the highest for third round coverage of the British Open since 2013 (3.1). The last time third round coverage aired on a broadcast network — ABC in 2009 — it earned a 2.4 overnight. Of note, Saturday’s telecast scored a higher overnight than the third round of the U.S. Open on FOX (2.5). Keep in mind the U.S. Open aired in a later timeslot (11 AM-8 PM, versus 9 AM-2:30 PM). **Martin Kaufmann praises NBC for tossing the playbook out and going all in on the final twosome. According to Classic TV Sports which did the always fine work of documenting the shots shown, NBC had a dismal number compared to the other majors. But again, no one minds given the two-horse race situation. John Strege in Golf World would like to have seen more Protracer but praises the broadcast for most elements, including NBC/Golf Channel showing, at some point, 155 of 155 players in the field. Ken Fang offers his Pros and Cons of the NBC/Golf Channel coverage, with a great screen grab of the LinksTrax feature which went largely unseen due to the soft conditions. Golf Channel’s Friday produced some nice numbers for very long broadcast windows. Phil's 63 and the likes of Spieth, Fowler and McIlroy in the window didn't hurt. TROON, Scotland (July 18, 2016) – NBC Sports’ coverage of The Open’s Final Round was the second-highest for a major championship final round in 2016 behind the Masters after posting a 3.94 overnight rating. Additionally, NBC’s overnight peaked at a 5.47 with a 14 share as Henrik Stenson outlasted Phil Mickelson to capture the Claret Jug from 1-1:30 p.m. ET, according to data released by The Nielsen Company. NBC’s coverage was the highest final round overnight for The Open in nine years (2008-2016), slightly ahead of ABC’s final year of broadcast coverage in 2009, which featured the playoff between Stewart Cink and Tom Watson at Turnberry (3.93). Additionally, this overnight rating was +50% vs. 2015 Sunday at St. Andrews (2.62, Rd. 3 coverage, ESPN); and +50% vs. 2014 Final Round at Royal Liverpool (2.62, ESPN). Coverage from Royal Troon Golf Club in Scotland ran from 9:15 a.m. to 2:00 p.m. ET on NBC, with Henrik Stenson, who is now the Champion Golfer of the Year, and Phil Mickelson teeing off at 9:35 a.m. ET. Jack: Henrik v. Phil Better Than The Duel In The Sun! While we gradually wrap our heads around a historic Open Championship and I slowly collect some good reads, I didn't want to let Phil Mickelson's comments about the Royal Troon setup pass by without a little copy and pasting for future reference. This was at the tale end of his post-65 final round press conference at Troon. Q. For those who don't follow golf as closely as others might, can you explain the difference between how the USGA sets up a course for the U.S. Open and how the R&A sets up a course for the British Open? And do you prefer one over the other? PHIL MICKELSON: I think that R&A sets the golf course up to be as fair as possible and to try to kind of identify who the best player is regardless of what the score is given the conditions and so forth. Sometimes it's 20-under. Sometimes people don't want that many under par. But the fact is if somebody plays some incredible golf, that's what it should do. You shouldn't have to mess with the course too much to try to control the score. The USGA has it in their mind that the score needs to be par, so no matter what lines they have to cross to get there, that's got to be the standard, and it kind of disregards and doesn't take into account the difference in talent level and abilities that the players of today now have. Q. Prefer one over the other? PHIL MICKELSON: I prefer this one, yeah. I think that it's much more fair. I think we all enjoy it. But I'm also biased because I've won this one and I haven't won the other one, so I've got that working against me. I wrote about Troon and the R&A's performance for the week in Golf World. Shirtless Henrik Stenson To Us: "I'm a little hot"
Arguably the most surreal element to Henrik Stenson's 20-under-par Open Championship win was his calm, cool demeanor and unusual (for him) fluid pace of play. No moment was more bizarre than the 17th when Stenson arrived at the tee, fresh off a key birdie from the native rough left of the green to maintain his two stroke lead. As fast as he'd walked up to the tee, Stenson immediately walked back down the tight-mow walkway toward the New York Post's Mark Cannizzaro and myself who were standing against the large scoreboard pondering the drama that had unfolded. "Shield me," Stenson said to us as he had just finished taking off the shirt, revealing his abs to the crowd, and leaving him with just his under armor. Stenson asked if he could moved behind us with the scoreboard as his backside shield, with only us and a day-glo clad policeman as his fronting shield, and then bared chest as he took off his undershirt while we awkwardly looked forward. "I'm a little hot," he joked, a nice duel reference to the temperature and his ninth birdie of the day. Stenson Wins The 2016 Open: Great Or Greatest Duel? Great duel or greatest duel? Because of the names involved at Turnberry and the way things went back and forth, it will be hard for any duel to ever surpass Nicklaus and Watson in 1977. (BTW, epic moment on The Open radio when one of the commentators asked if there had ever been a duel like this...that was quickly explained away). However, given the quality of the play by Henrik Stenson and Phil Mickelson, cases will be made that this was (A) in the conversation for all-time great major final rounds since Stenson was facing down his rival, and (B) the scoring separation was unprecedented. A couple of Tweeted stats from Golf Channel's Justin Ray put the latter notion into perspective. Phil Mickelson finished 11 shots ahead of 3rd place. 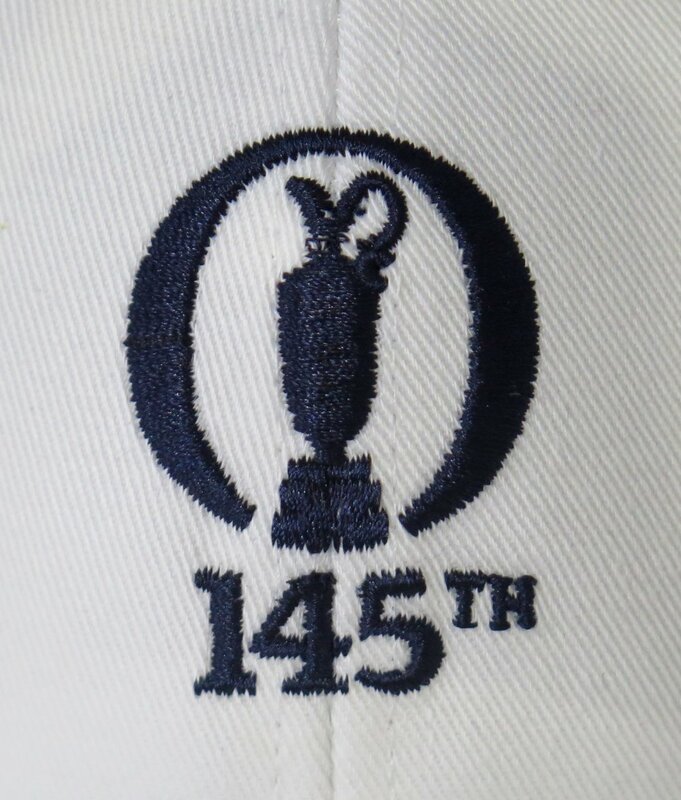 Nobody has won #TheOpen by 11 or more since 1870. Being out on the course for the last portion it was almost a surreal exhibition of skill and class. Both players showed no signs of nerve and both played remarkably fast (but never rushed). It all happens so fast and both Mickelson and Stenson made the moment look so easy, putting what we saw into perspective can be tricky. Poll: Who Will Win The 2016 Open Championship? As John Huggan notes, Henrik Stenson is trying to shed a label as one of the best (arguably the best) player not to have won a major. As I note at GolfDigest.com as well, Phil Mickelson was upbeat during a 1-under-par 70, with very specific swing work to button up with Andrew Getson for the finale at Royal Troon. Mickelson said it is not a match play situation for him, but it is essentially a two-man race starting at 2:35 pm. Before I enter the Internet and 21st century dead zone that is an R&A's handpicked media hotel, who do you like? Who will win the 2016 Open Championship? Rory Still Not Using Enough Lower Body In His Club Hurls! I'm greedy, I want more lower body ala Tommy Bolt! Oh, and a little Protracer on the club's path would have happened in an ideal world. Jordan Spieth's logic seems perfectly reasonable: he gets negative questions about his 2016 game given that it's no where near his 2015 game. But given that he hasn't posted an under par score since the first round of the Masters and is skipping the Olympics for undisclosed health reasons, I'm not entirely sure the positive questions would be flowing, either. The full clip after Spieth's 72 at Royal Troon leaving him at +5 for The Open. 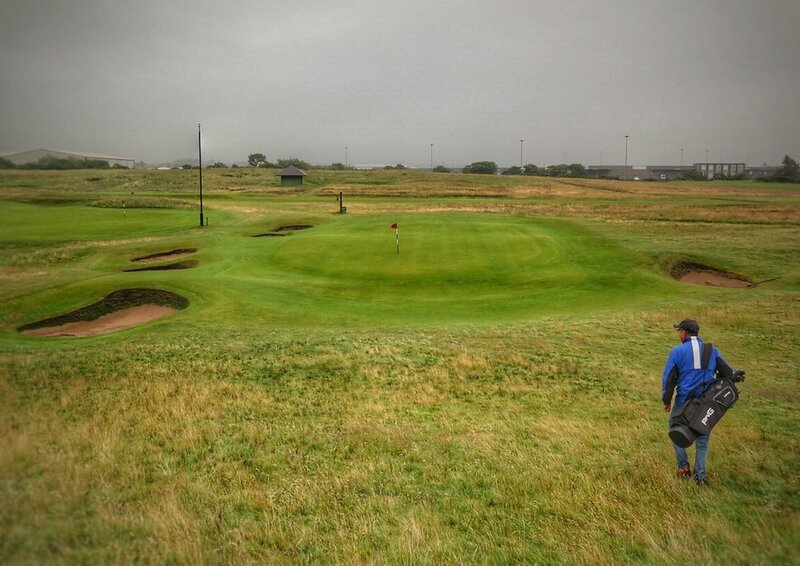 It's a bleak forecast for the players, a potentially captivating one for us watching the 145th Open Championship's third round at Royal Troon. Your third round tee times. For American audiences, your Golf Channel/NBC telecast times. TheOpen.com also features live coverage. John Huggan says 36-hole leader Phil Mickelson was “drookit” after a wet 18-holes over Royal Troon. Michael Bamberger feels a Mickelson win would be epic in further defining his sensational career. The 36 holes he has played at Troon, completed in a mere 132 shots, is just the latest. Like Fred Couples before him, he will be a factor at Augusta, at least now and again, for the next 10 years or more. Why? Because he is what he has always been, a golfer with a unique skill set and outsized desire. The thrill of competition just means too much too him. Tiger Woods burned out. Surely, his fade is rooted in an uncooperative body. Ryan Lavner on the third round setup adjustments. After the setup staff reviewed the course and forecast early Saturday morning, certain hole locations and tees were also moved before the 81 players began their day at Royal Troon. The greens were rolling at about 9 1/2 on the Stimpmeter. 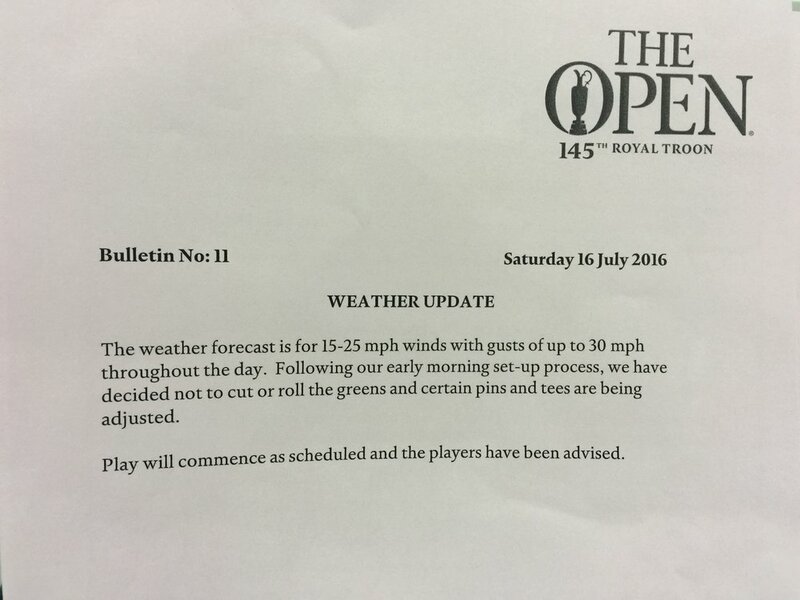 Here was the weather update greeting us at our work stations today, suggesting the R&A has no desire for a play stoppage should the wind kick up. Lavner also explains what Mickelson did with Dave Pelz to make himself a better links player. Jim McCabe ponders the luck of the draw and Steve Stricker says players have to resist the urge to throw themselves a pity party. There were 52 games sent out Friday, and of the 26 players in red numbers heading to the weekend, 22 of them had earlier tee times on Friday. The only players who played late and finished under par were Patrick Reed (74), Byeong Hun An (70) and Rory McIlroy (71), all at 2 under, and Rickie Fowler (72) at 1 under. 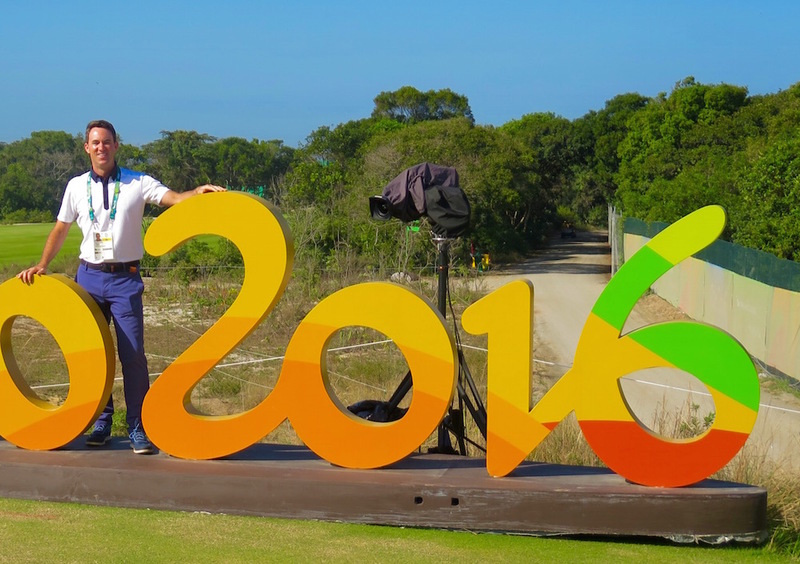 Rory McIlroy also got the wrong side of the draw but he’s not getting down about his luck. Paul Weaver reports for The Guardian. Jason Day played a miraculous round in the afternoon wave to get to +1 and hopes there is more of it Saturday, if he can dry his stuff out. Mark Tallentire reports. Billy Horschel found a way to move the needle for the first time in ages. Alex Myers reports. I wrote about Matthew Southgate for GolfDigest.com. What an inspirational story. Jaime Diaz on short par-3s after watching some golf at the Postage Stamp. I wrote for GolfDigest.com about how the double-breasted's from the R&A (of all groups) are doing quality grow-the-game work by presenting a fun, relaxed Spectator Village which also accomplishes the goal of giving some exposure to their corporate partners. And finally, Phil Mickelson's binder clip/hat adjustment is drawing plenty of scrutiny, reports Alex Myers. The rain has come and the players going out early in round two finally experienced inclement conditions (as expected). Phil Mickelson managed his way around until a bogey at 12, but he nearly aced the Postage Stamp. A few notes as you watch the Golf Channel telecast in the States. Your second round tee times. Players are wearing ribbons in honor of the victims from the Nice tragedy, Ryan Herrington reports. Jordan Spieth, Rickie Fowler, Jason Dufner, Jimmy Walker and Zach Johnson are sharing a house and having a jolly time at The Open. Steve Hennessy explains. For a UK take, Jonathan Liew of the Telegraph reports. Alex Myers walks out to the Postage Stamp to take in the wee hole. You forget how far out this course goes before turning back to the clubhouse. The Railway hole was a beast in round one, my take for GolfDigest.com and Richard Bath's look for the Telegraph. The Postage Stamp didn't play favorites either. Ryan Lavner with the lowdown on the struggles there. Which reminds me, The Open's app is a must download for featured 6-7-8th hole coverage. If you're on site or coming this weekend, it will even map you through the course to get to a preferred spot or group. Jim McCabe looks at the early dominance of Americans and says we should not be surprised given the history here. The latest odds have Phil 15/8. There really wasn't a 62 in the air for Phil Mickelson until the birdie putt on 17 went in, and as I noted for GolfDigest.com based on my observations from the course, even Mickelson wasn't thinking it until late. But once he did, the heartbreak of such a lipout was evident. Tiger still thinks about his putt at Southern Hills in 2008 and Phil will remember this one for the rest of his life. And 62 remains safe, as does the legacy of the Golf Gods. That said, it's still a 63 in The Open, the last tournament Phil has won since 2013. After the round, Ernie Els lamented the missed chance at history but spoke of his pleasure in watching it unfold. Alex Myers reports. **The Golf Channel video of the putt and the reaction. The clubs in Phil's bag for the 63 courtesy of A.J. Voepel. The big prize, of course, is the tournament, not the scoring record. A 62 might have been huge, but it would not have mattered nearly as much without going on to win. And imagine how historic that would be? He would be the fourth-oldest winner, ever, in any of the major championships.